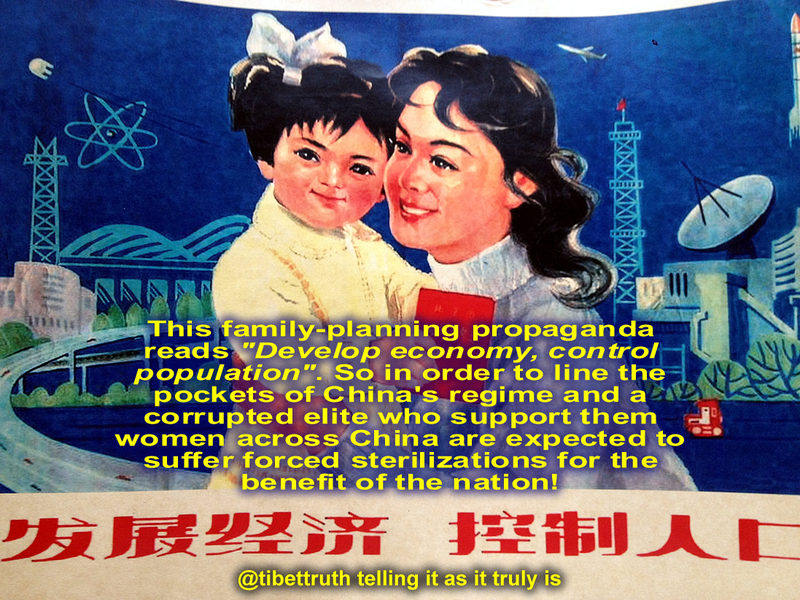 One of the great fictions subscribed to by a number of prominent Tibet related organizations is that Tibetans are exempt from the atrocities generated by China’s notorious birth-control program. Such groups form this conclusion based upon the official declarations of the Chinese regime, interviews with a handful of Tibetans or the claims of anthropologists whose career interests require a pro-China line! Curiously such credulity towards an authority expert in deception and propaganda does not extend to other human rights issues. Seems there’s a disconnect at work, with salaried lobbyists simultaneously rejecting China’s claims that Tibetans are not subject to human rights abuses, yet willing to accept without critique assertions from the Chinese government that the grim excesses of China’s one-child policy, including forced sterilizations, are not applied in occupied Tibet! There exists however a considerable body of detailed information, testimony and witnessed accounts that reveals Tibetans have indeed suffered such abuses and continue to do so. Moreover statements from a number of Chinese officials have over the years conceded such a reality, the most recent was featured in a report by Zee News, an Indian based news-site. Sadly mainstream media has a tendency to repeat as factual the official pretensions served up by China’s regime, a habit much to the delight of the Ministry Of Disinformation in Beijing which uses such gullibility to spread various propaganda aimed at diluting and deflecting international concern on any range of human rights issues. Meanwhile of course the violations continue, as women in China who suffer forced sterilizations would testify. The Zee News report however, while displaying a naivete of breathtaking proportions, reported a concession from Yang Wenzhuang that Tibet and East Turkestan had not yet relaxed the regulations pertaining to the one-child policy, now the propaganda line is that so-called ethnic minorities were exempt from such restrictions. Yet here we have a leading Minister in China’s Family Planning Commission acknowledging without qualification that these occupied territories have indeed been subject to such regulation! Hi, I’m really interested in reading more about this situation in occupied Tibet. Where can I find more information about this – I mean the accounts you refer to? Have they been published, and where?